Are you a bass or keyboard whiz? Billy Corgan is looking for you! 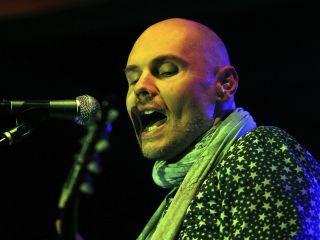 Billy Corgan has announced that The Smashing Pumpkins are looking for a new bassist and keyboardist, and he's launched two websites for musicians to be considered for the gigs. This comes in the wake of bassist Ginger Pooley's decision to leave the band to raise her new baby with her husband. Until a new bass player is found, Mark Tulin of The Electric Prunes will fill in on an interim basis. In a statement, Corgan said, "Although I am heartbroken that Ginger is leaving the group, I really respect her decision to put her family first. I appreciate everything that she has contributed to The Smashing Pumpkins, and I'm proud of her for being such a great musician and friend. 'We were lucky enough to find drummer Mike Byrne through an open audition process," Corgan added, "so why not open the doors again to anyone who might be interested for the bass or keyboard position. As you can see from our past and present, age, race, or a person's background is not an issue. Everyone is truly welcome to audition." Bassists and keyboardists looking to play with The Pumpkins should send their background info (including age, a resume of any bands/recorded work), photos and performance web links via email only, either to pumpkinsbass@gmail.com or pumpkinskeys@gmail.com. Note: only musicians with video clips can be considered. Youtube.com type posts are most welcome (that's how Mike Byrne was found). Final date for submission is 31 March.